This is a good PLC project on development of sump pump logic for Pipeline Automation and will also give you overview of PLC. 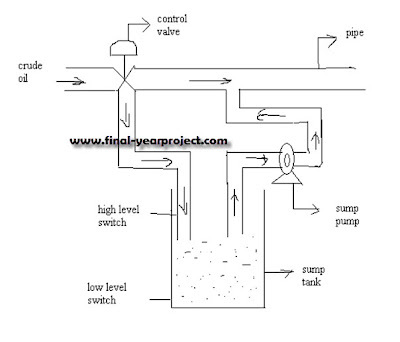 This project mainly deals with the development of PLC logic for sump pump application. In this project we decrease the pressure of the pipeline by drawing oil in to the sump pump tank through valves and refilling it in to the pipeline through sump pump automatically when the sump tank level reaches maximum. You can also Subscribe to FINAL YEAR PROJECT'S by Email for more such projects and seminar. PLC finds its major application in “PIPELINE AUTOMATION” where crude oil is transported from oil field to oil refineries and used for controlling the field devices like solenoid valves, level switches, pressure switches, temperature, pressure transmitters, sump pumps etc. 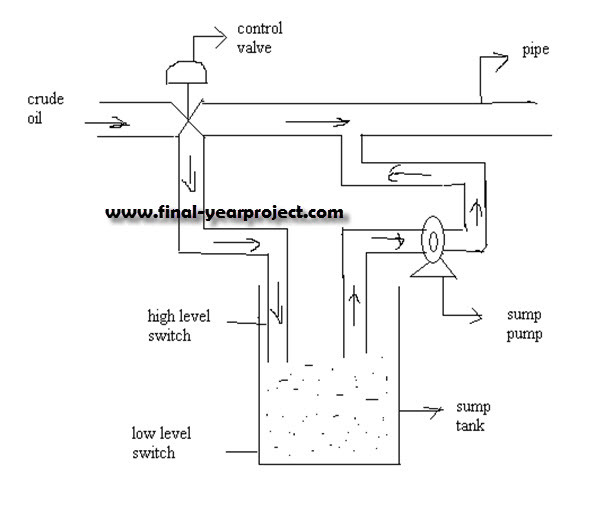 The report consist of Sump Pump block diagram, flow chart, its ladder logic i.e PLC program etc. PLC used here is of GE FANUC PLC 90-30. Use this project for your reference and study work only.